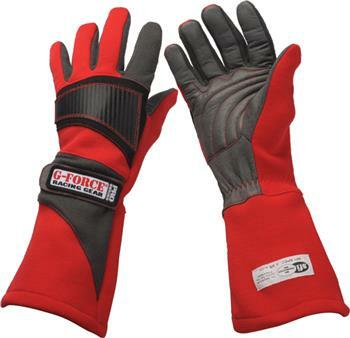 G-FORCE Gloves - GF Pro Series UNIVERSAL - Lesher Motorsports, Inc. The all new GF Pro Series Race Glove was designed to meet all the demands of today’s amateur and professional drivers. This attractive 2-tone glove meets the requirement of SFI 3.3/5 and comes with the official SFI issued tag to prove it! Premium leather and Nomex is used to build this 2 layer glove that is accented with a carbon fiber printed knuckle pad and contrasting stitching. The wrist gauntlet is secured with the Velcro backed G-FORCE Racing Gear label. These gloves are produced to accent the new GF236 Pro Series Shoes.